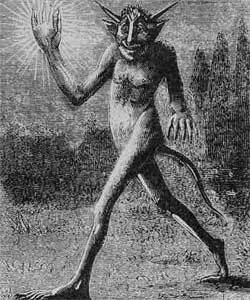 Yan-gant-y-tan is a demon from Brittany, who wanders the night holding 5 candles on his 5 fingers. He may also be Will-o’-the-Wisp and Jack-o’-Lantern. Yan-gant-y-tan (Jan gant y tan) is one of the lesser-known demons mentioned in Collin de Plancy’s Dictionnaire Infernal. De Plancy gives only a brief description – that Yan-gant-y-tan is a demon from Brittany who wanders the streets of Finistere at night holding five candles in hand – one on each of his five fingers – spinning them like a flaming wheel. Yan-gant-y-tan is cautious not to make abrupt or sudden turns, less he accidentally extinguish his flames. The accompanying illustration shows the demon as a troll-like creature covered in fur. In Edgar MacCulloch’s book, Guernsey Folklore (1903), Jan gant y tan is known as “John with the fingers or gloves of fire” and equated with the Guernsey “Lie Faeu Belengier” (the fire of Belenger aka rolling fire), known to the English as Jack o’Lantern or Will o’ the Wisp. According to MacCulloch, Belenger is a variation of the name Weyland the Smith, blacksmith of the Scandinavian gods. In Norse mythology, Weyland married a Valkyrie, who gave him a ring before she eventually left him. King Niðhad in Nerike desperately wanted this treasure so he abducted Weyland, severed the sinews of his feet, and imprisoned him on an island, forcing Weyland to forge whatever items he requested. The king also gave Weyland’s ring to his daughter, Bodvild. Weyland did as the king asked, waiting for his opportunity for revenge. When the king’s sons visited him in secret, Weyland killed them, crafting goblets from their bones, jewels from their eyes, and a brooch from their teeth – which he sent to the royal family as gifts. Later, when Bodvild brought Weyland her ring to be fixed, he raped her, took back his ring, and escaped on wings made from bird feathers. In English folklore, the name “Belenger” is related to “Velint” or “Wayland Smith,” and tales describe Wayland as condemned to wander the night. Travelers would often report they saw fire from his forge above marshes and heaths. Similarly, in Guernsey folklore, a belenger is a spirit in pain, who wanders the nights searching for a way to commit suicide. Unfortunate travelers who encounter this type of spirit can ward it off by sticking a knife into the ground with its blade facing up. The spirit will attack the blade, attempting to kill itself. Also, the presence of a belenger’s flickering flame may reveal the existence of hidden treasure, though many travelers have lost their way by following the light. According to English legend, “will-o’-the-wisp” are ghostly flickering lights that appear over marshes and bogs, receding if approached, leading weary travelers off their safe paths. The term comes from “wisp,” which refers to a stack of paper or bound sticks that can be used as a torch. While many cultures have tales about will-o’-the-wisp, one particular story, recounted by K. M. Briggs in her Dictionary of Fairies, involves a wicked blacksmith named ‘Will the Smith.’ When Will died, he convinced St. Peter to allow him a second chance to live a more virtuous life. He was granted the opportunity but continued his evil ways. This time, when he died, neither heaven nor hell would take him. With the Devil’s gift, a piece of burning coal to warm him, Will is said to wander the Earth using his light to lead travelers astray. A similar Irish tale involves Stingy Jack, a greedy, unsavory fellow who invited the Devil to have a drink with him one night. When bill arrived, Stingy Jack convinced the Devil to turn himself into a coin Jack could use as payment. The Devil complied, and Jack slipped the coin into his pocket next to a silver cross, thus imprisoning the Devil instead of settling his pub tab. Eventually, Jack agreed to free the Devil. In exchange, the Devil agreed not to bother Jack nor claim his soul when he died. True to his word, when Jack died, the Devil refused him entrance into Hell. Since Heaven also wouldn’t grant him entrance, Jack was condemned to wander the earth for eternity. The Devil did offer him one boon – a piece of burning coal Jack placed inside a carved-out turnip to carry with him during his travels. Our modern-day jack-o’-lanterns come from this legend. To ward off Jack and other evil spirits, the Irish, Scottish and English would carve scary faces into turnips, potatoes or large beets, then place them in windows or near doorways. Immigrants brought the practice to America and adapted it to pumpkins.